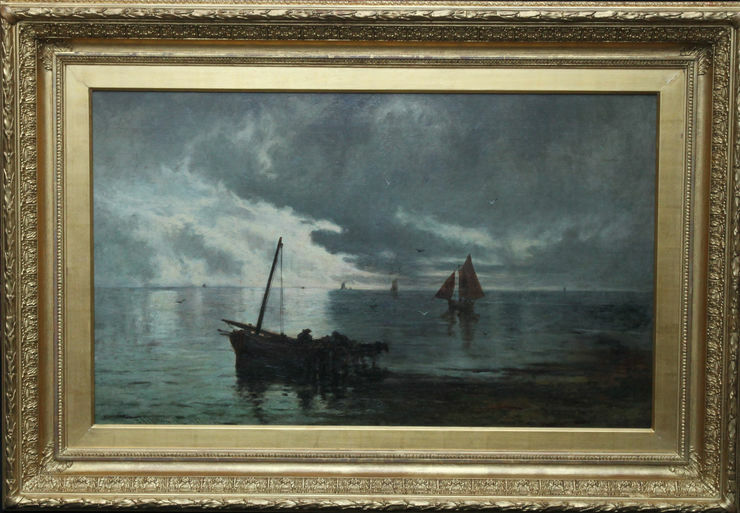 This atmospheric Scottish Victorian oil painting is by noted Scottish artist George Aikman. Painted circa 1870 in the muted Impressionistic tones of evening fall, the sky and waters are actually rich with purples, pinks and lilac impasto. 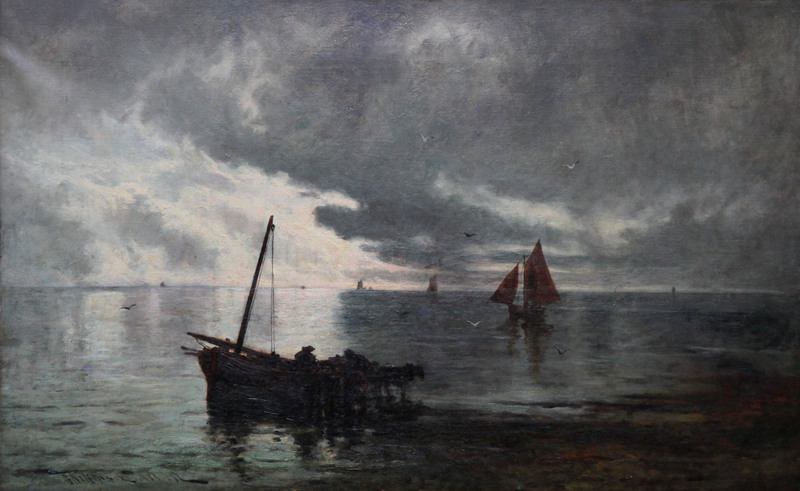 Aikman often painted coastal and harbour scenes and this is a particularly fine example. The painting is of the days catch being unloaded, with seagulls in attendance and more vessels yet to come to shore. Housed in a complimentary frame, 47 inches by 32 inches and in good condition. George Aikman ARSA 1880, RSW 1878 (1830–1905) was a Scottish painter and engraver. Born in Edinburgh, George Aikman was the ninth child of George Aikman (1788-1865) and his wife Alison McKay. The father, after employment by William Home Lizars the engraver, started business for himself about 1825 in Warriston Close, where he produced the plates and illustrations for the Encyclopædia Britannica seventh edition. Many of these were drawn and engraved by his son George. From a private school Aikman was sent to Edinburgh High School, where he was for three sessions in the class of Dr. James Boyd. He was then apprenticed to his father, who had moved his business to 29 North Bridge, and after a journeyman period, during which he worked in Manchester and London, he was admitted a partner. As an apprentice he had attended the classes of the Trustees' Academy, then directed by Robert Scott Lauder, and the Royal Scottish Academy life-class. By 1850 Aikman was showing work at the Scottish Academy exhibitions, but it was not until 1870 that he abandoned business for painting. In 1880 he was elected an A.R.S.A. Between 1874 and 1904 he exhibited at nine of the Royal Academy exhibitions in London. Aikman's theme as a painter was landscape, particularly in the Perthshire Highlands and Warwickshire. He practised etching during most of his life, and towards the end he engraved mezzotints. Impressions of some of these were exhibited, but only a few of them were published. On 2 December 1859 Aikman married Elizabeth Barnett, who with three daughters and two sons survived him. Aikman died in Edinburgh on 8 January 1905, and was buried in Warriston cemetery.